Multi Academy Trust websites offer an opportunity for an MAT to guide the public perception of it’s academies as an authoritative source. Immediately identifies each school as a member. 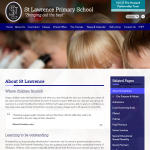 A source of information for visitors referred from a trust link on the school website. Aids the trust in establishing it’s branding identity through variations on a common theme. Keeps a tidy design consistency across the number of academies. When visiting links to the schools from the MAT website, the whole browsing experience is more on brand. 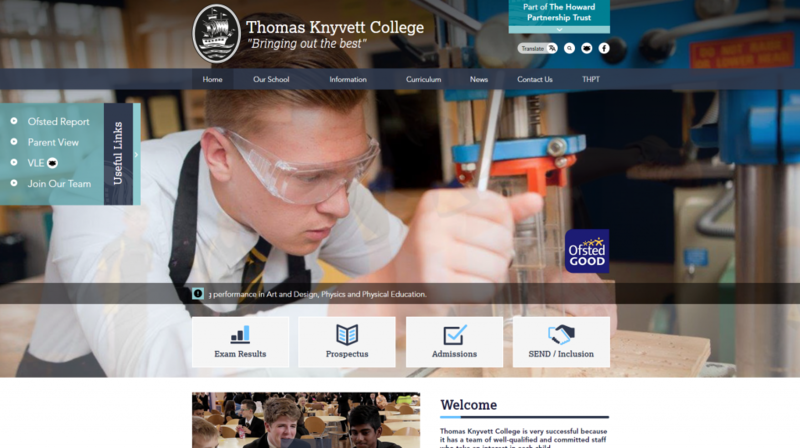 Once Multi Academy Trust websites have been completed, we can complete the subsequent academy websites much faster. 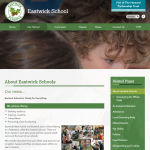 As a result, we can provide great cost savings for trusts who would also like a group of websites for their academies. 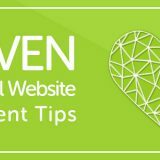 If the MAT would like to occasionally manage an aspect of a school’s website, the Content Management System (CMS) is familiar across the board. 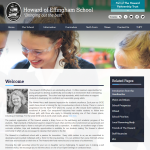 The school benefits from a superb new website. Minor differences can still exist in layout. 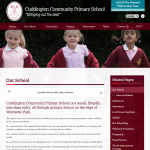 For example, some schools may not have a twitter feed to display. The academies can preserve their identity and keep their own branding, colours, logo and photos. 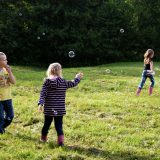 The school can be easily identified as part of a trust. 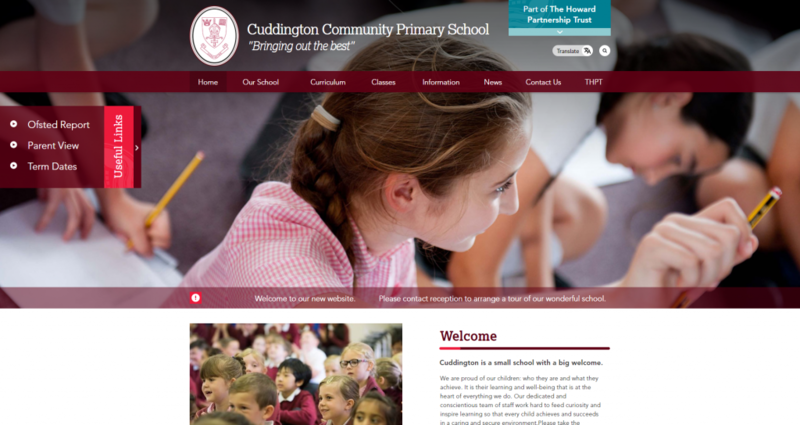 Our CMS has been created with schools in mind. 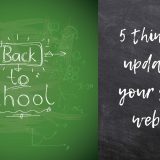 There are lots of school specific features to make updating the website quick and easy. 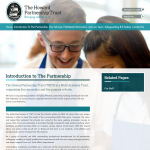 The Howard partnership trust is based in Surrey and is composed of four secondary and five primary schools, of which we provide almost all of the websites. 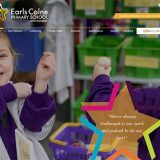 The trust’s website serves as a central hub to those schools, and provides a branding foundation upon which each subsequent website builds. In terms of design, the website for THPT is a blend of classic and modern design. 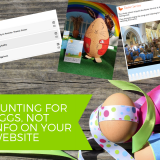 Two big features are their twitter feed, enabling visitors to keep up to date with the schools in the trust, and large box links to each school, which is a good idea in Multi Academy Trust websites. 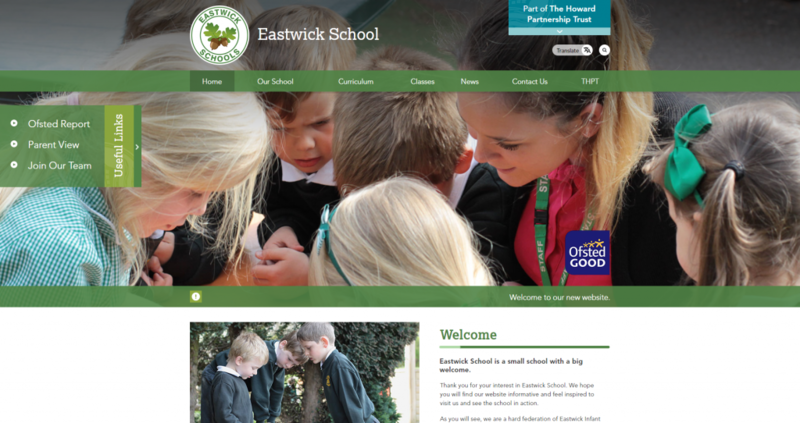 Here, with the website for Eastwick School, we see a great example of a school adopting the look of the group of the Multi Academy Trust. 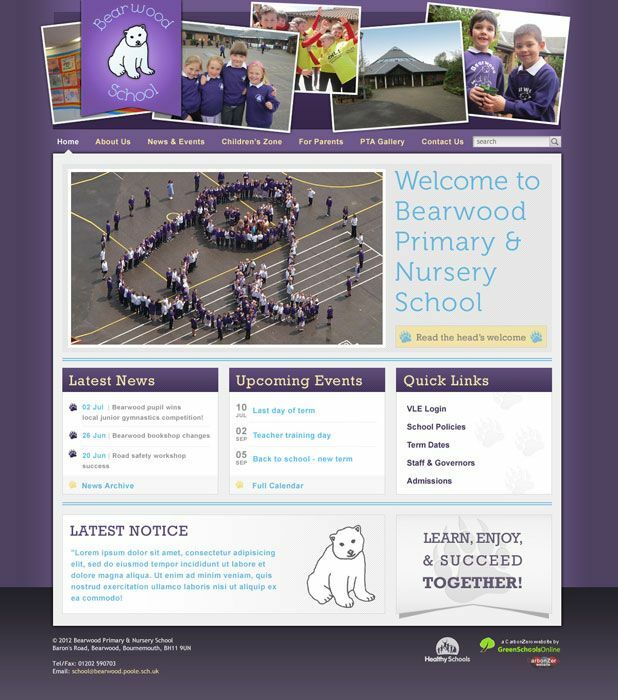 As this this is a school website as opposed to a trust site, there are a few differences. Though we can still clearly see the “family resemblance”. A pull-out tab at the top provides additional information on The Howard Partnership Trust, and a link to the MAT website. The left gives displays a collapsible useful links tab. Underneath the gallery sits a scrolling ticker, which is useful in delivering casual information bulletins. Beneath the welcome message and photo, the website displays a twitter feed and a latest events panel. 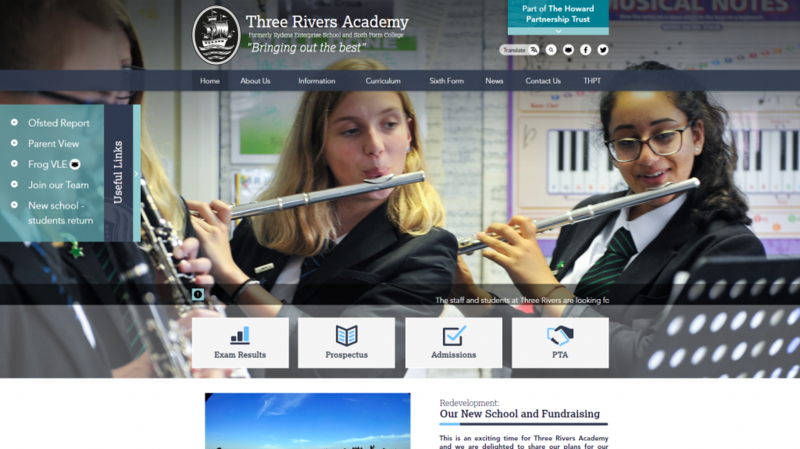 Now, the beauty of consistent design for Multi Academy Trust websites starts to become clear. While the school keeps it’s own identity through logo, photos, branding and content, it can still enjoy the uniform of the MAT to which it belongs. While we are on the subject of uniforms, you’ll notice that the school colours of the design compliment with the inform colours in the photos. Photography can make a big difference to the impression your website makes. We would be happy to discuss sending our excellent photographer. Many schools however, choose to make a big cost saving by using their own photographs or by approaching a parent or staff-member with the nicest camera. 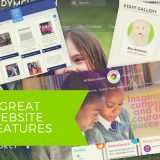 Sometimes, when a school becomes part of a Multi Academy Trust and benefits from a great website with us, they have some resources or material that they would still like to use. 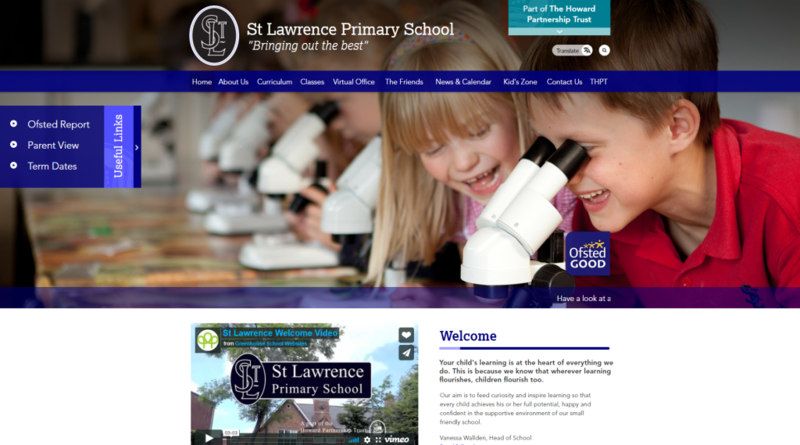 St Lawrence has a great video for their homepage (not be confused with a “background video”). It sits perfectly in the space where a “welcome photo” would otherwise be. An important note on videos on your school website is that while our CMS can host and embed your video just fine, they are most often better hosted by a video content hosts like vimeo, youtube or teachertube. The reason being is they are fantastic at serving the best quality for the connection device type. 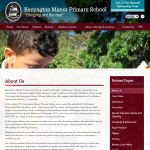 Another small variation on the core design; Kenyngton Manor Primary School have a welcome video, plus a link in their welcome message to both their nursery and children’s centre pages. We like their photos too. Now would be a good time to mention the powerful google translate button in the header of the site, and search functional. 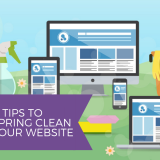 We offer these to all of our websites free of charge, not just to Multi Academy Trust websites, but to any school site. 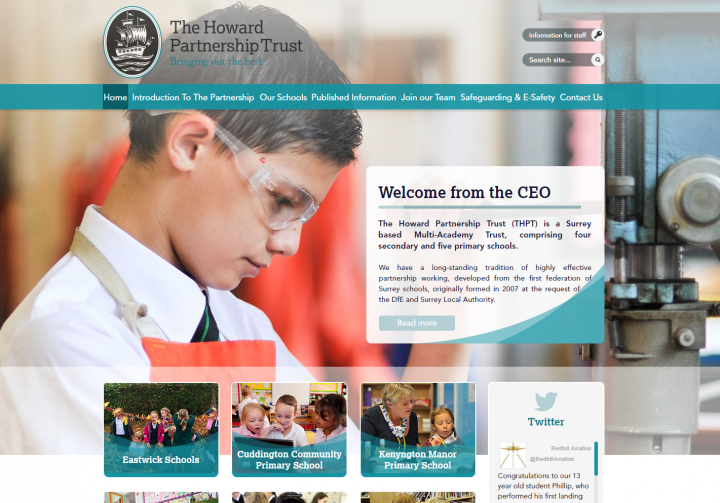 So far, we’ve compared primary school websites within the Howard Partnership Multi Academy Trust. 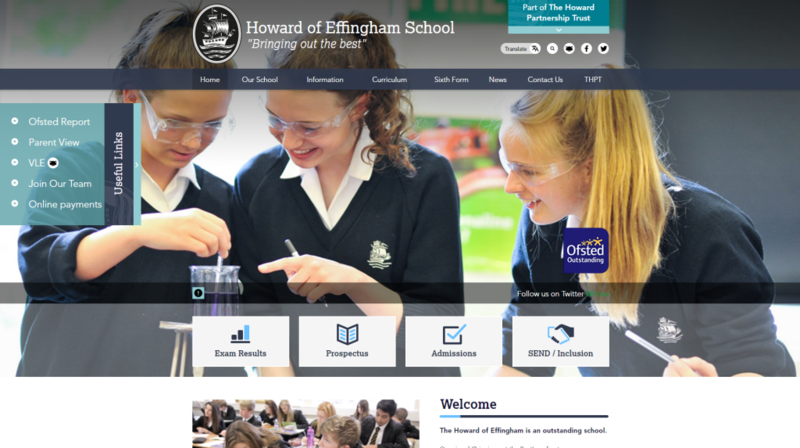 Howard of Effingham is their flagship school, and it’s website is an excellent example of how even primary and secondary schools can share a group look. 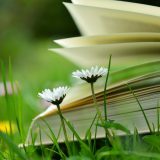 There are a few differences that are necessitated by the increased resources and utilities important to secondary schools. The header features the school’s Frog link, and has social links in the header as well as their feed below the welcome. 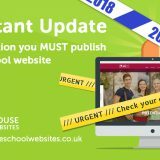 Over the main photo banner, the school displays easy access links to Exam Results, Prospectus, Admissions and their SEND page. A strong layout foundation lends itself so well to group designs within a Multi Academy Trust, that all might need to change is the photos, logo and content. 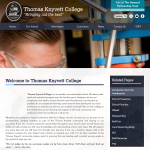 Thomas Knyett’s website was a very efficient process as a result. This website, like all others we’ve looked at so far show another benefit of groups of Multi Academy Trust Websites; next to the upcoming events panel, you’ll see a recruitment link to work for the trust. 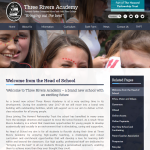 Finishing off the fantastic group of websites that make up The Howard Partnership Trust is Three Rivers Academy. Their welcome message proudly shows an interesting timelapse video of the construction of their new school building. They have re-purposed their SEND link box as a link to their PTA. The Academy also boasts a very active twitter feed. If you’d like a chat about how we can help your Multi Academy Trust with a family of websites please just contact us.